Why I Love is a series of guest editorials on GamesIndustry.biz intended to showcase the ways in which game developers appreciate each other's work. This edition was contributed by Dr. Tomas Rawlings, design director at Auroch Digital (Achtung! Cthulhu Tactics, Ogre) and a co-founder of Bristol Games Hub. Making games is hard work. So much of what we do requires leaps of faith. We have to imagine the gameplay, imagine the technology that will bring that gameplay to life, imagine the visuals and sounds that will best communicate this new world to the players. There are a lot of things that can go wrong with so much imaginary speculation. But when things go right, the result becomes so much more than the sum of its parts. Collectively all these imaginings can make, well, magic. That's why our shared medium has so many people playing, watching, creating and talking about games. But how do you know when you've got that magic? For me it emerges during play when I'm so joyously lost in the game that much of the real world fades away. The game world becomes your world for a time. Many moons ago a younger me was staying at a friend's house, crashing on the sofa in the living room. I was having a few games with the house Mega Drive when I noticed that they had a game I'd not played before: Dune II. I'd enjoyed the David Lynch film, but not yet read the book (I would go on to after the game) nor played the original Dune game. So I gave it a quick bash, planning to give it a go for 20 minutes or so, just to check it out. I then proceeded to spend all night and much of the next day playing it. I was hooked until I'd completed it. If you don't know the story of Dune, why the heck not??!! The essence of the story concerns a valuable resource - spice (aka melange) - that allows a form of faster-than-light travel, an allegory of the oil that humans fight over today. (Like all the best art, it speaks to something within us or about our reality!) This spice is super valuable and rare; the desert landscapes of a planet known as Dune is the only place that the spice can be found. Yet Dune is also home to enormous mile-long sandworms that hunt in the spice-fields, making harvesting it hazardous to say the least. Control of the planet is periodically given to different dynastic houses who are tasked to ensure regular quotas of spice gathered however they see fit. Provided the spice flows, the galactic elite who rely on it care not how it arrives. Dune II took this setting as the inspiration for one of the first real-time strategy titles. It pioneered many of the forms and conventions that RTS games (indeed strategy games!) use in ways we still see today. Lest we forget that the children of Dune II have gone on to conquer the world, League of Legends, Dota 2, Clash Royale, Starcraft, Warhammer 40,000: Dawn of War, Total War and many, many others still have some DNA from this gem of a game. From the player's direct control of resources, to tech-trees, to building units, to commanding an emergent army - and doing all of this in the same screen was mind blowing. "When I want to point to an example of brilliant IP work for a potential client, often I point to Dune II. It obeys all the rules of what a good IP project should be"
Back them I loved strategy games, but they tended to be a bit slow. Yet here was the action of combat playing out, not in turns and sub-screens and distant simulations reported via stats boxes, but right here, right now, right in front of you. It had an addictive immediacy. Not only that but it had so many innovations of gameplay which have in the years since its release become so common that we now take them for granted: context-sensitive in-game user interface, factions with specialist unit types, an AI that builds and attacks as you do, resource gathering, unit construction, base building, deployable buildings... all this good stuff wrapped within a well-balanced narrative campaign. It was and is a brilliant set of gameplay concepts, superbly executed. Be a great game even if the IP was not there. Build the experience of the IP in the mind of the player. Rule 1: If this game didn't have the Dune IP, it would still be an amazing game. That's key - the game must be good else everything else fails. To quote Jason Della Rocca (from his 2017 GDC talk), "No amount of entrepreneurial savy, no amount of salesmanship or pitching skills or all that kind of stuff is going to matter if you're not making great games." 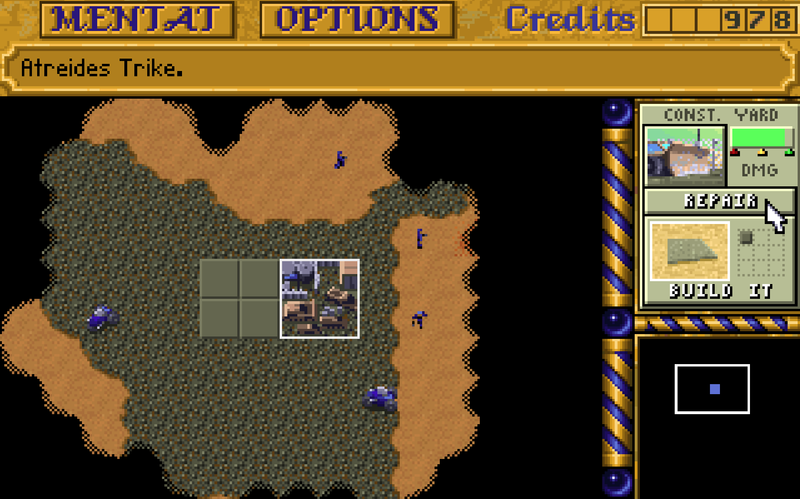 Dune II is not only an amazing game, but it's innovative beyond most non-IP titles too! Rule 2: If the developers had just created a strategy game that themed the units and story from Dune, that would be OK. However they didn't stop there - the desert is not only the source of your power (spice) but also a place of great danger (sandworms!) Your spice collectors are liable to be eaten by sandworms and so you need to always balance the risk/reward of filling your coffers while not losing collectors to the planet's apex predator. By placing this dynamic at the root of the player actions--the harvesting of spice--the developers have made a game that fits the Dune universe perfectly. The IP so well applies to the gameplay that it becomes another element that lifts the quality of the whole work. So the resource gathering has a superb narrative hook, developed into the rest of the game and story. The buildings decay because of the hostile desert sand, the factions and unit types match the novel's protagonists, and the campaign mirrors key story aspects. It's a great use of IP, a masterclass in making the IP work alongside the game. Dune II is one of the most important games ever made for its innovations and is also one of the best games ever made for its gameplay. Playing it makes me happy. BTW while we're on the subject it needs a reboot ASAP! I'm willing to take it on, let's talk! I have many ideas... But also I would also be super-happy if someone else did so then I can just have the simple joy of playing it. Developers interested in contributing their own Why I Love column are encouraged to reach out to us at news@gamesindustry.biz. Great article. I got to play Dune2 later than everyone else due to location. While I loved Dune2 for it's novel gameplay, I think the Dune IP as used in games peaked in Cryo's Dune. A lovely use of the IP in that it was used extensively, not just a few set-pieces here and there. The mix of RTS with a point-and-click adventure was also pretty nifty at the time. Alas, getting the Dune IP is a difficult task nowadays, or so it is rumored.